I wasn’t living in NYC at the time but I remember September 11, 2001 well. I watched everything unfold on television from Phoenix and had a hard time comprehending what was happening. While I can’t imagine what it was like living in NYC at the time, I think about it often. It was important for me to visit the National September 11 Memorial & Museum. Let me tell you about our experience and explain why you must go to the museum at Ground Zero when you visit New York City. The 9/11 Memorial is a beautiful tribute. Here is a photo of one of the two pools that make up the 9/11 Memorial. 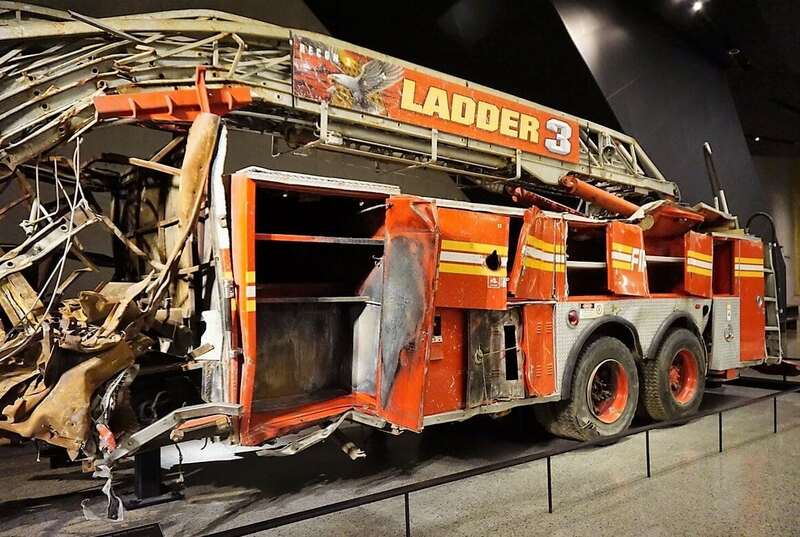 I visited the 9/11 Museum for the first time shortly after it opened and found it moving. I went with my friends Kat, Beth, and Terry who were visiting from out of town. We had early dinner plans that night since we were seeing a Broadway show, and couldn’t stay at the museum as long as I would have liked. I knew I need to come back and I knew I wanted to bring Russell with me. We wanted to be some of the first people into the museum when it opened at 9, so we thought we would get there early and spend some time at the 911 Memorial before we went in. I think they did a great job with the Memorial, it is the perfect tribute to the victims. 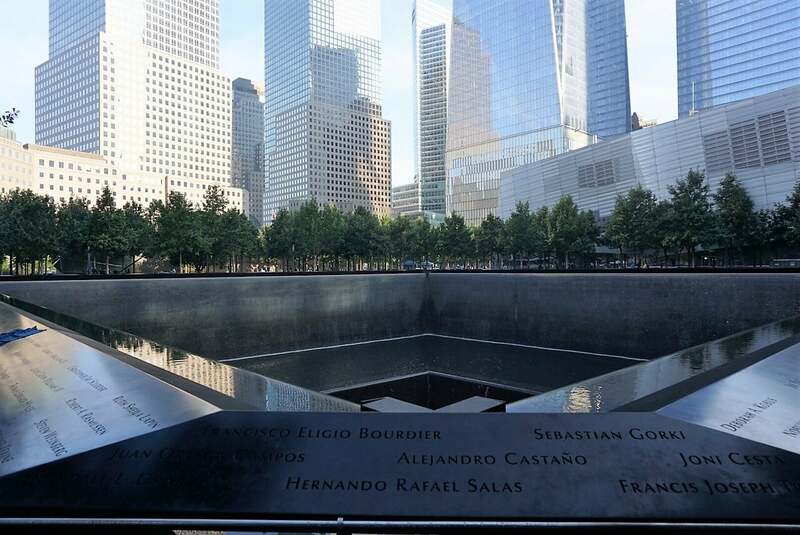 There are two waterfalls leading to two large pools of water in the footprints of the twin towers with the names of the victims inscribed around them. The waterfalls are the largest manmade waterfalls in North America. You will also notice that the National 911 Memorial is surrounded by trees. One of the trees is known as the “Survivor Tree” because it actually survived the attacks although it was severely damaged, the roots snapped and several branches were burned and broken. The tree was rescued from Ground Zero and the New York City Department of Parks and Recreation nursed it back to health. The tree was returned to the Memorial in 2010. Now you can see new, smooth limbs coming out of the damaged stumps. It’s a dramatic reminder of the tree’s past and present. Today, the tree is a living symbol of resilience, survival, and rebirth. I had visited the Memorial several times before both during the day and when it is beautifully lit up at night, but I spent more time paying attention to the details during this visit. I saw a sign that said the 911 Memorial and Museum places a rose in the names of those who were born that day. On several previous occasions, I had seen roses placed in the names but never knew the reason. I wanted to see who had a birthday so we walked around both pools. Anisa taking time to read the names at the memorial. As we were walking around the pools, I noticed several things that I hadn’t seen before. First, the victims that were pregnant at the time of the attack were listed along with their unborn child. We saw several names like this and it ripped at my heart. I also hadn’t realized that the names of those that died in the airplanes and other locations (Pentagon and Shanksville, Pennsylvania) were also listed on the memorial. I knew the names were grouped so that those that worked together would be listed together, but I didn’t know there was a special area for first responders. Those guys were real heroes and it warmed me to know they were recognized. The rose placed in the name signifies it was the person’s birthday. We only found one rose the day we went, but it was worthwhile walking around the Memorial and seeing all the names. Then it was time to visit the Museum, which is actually located under the Memorial. 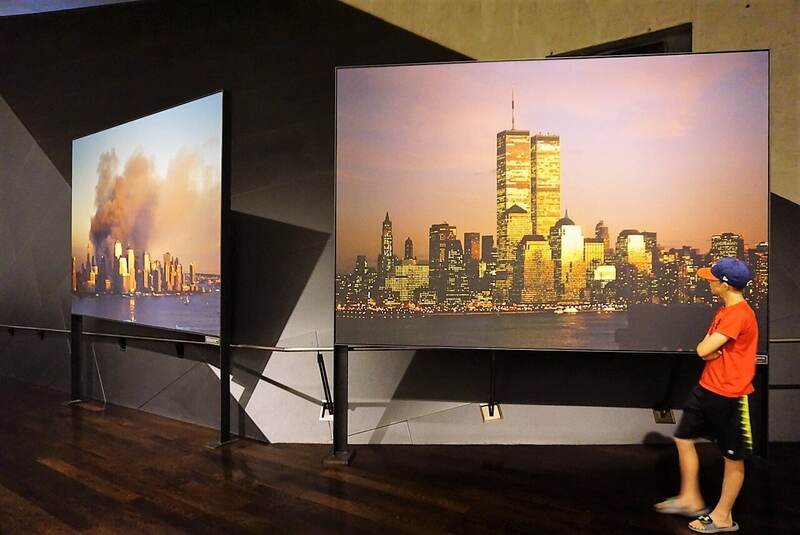 The fact that the Museum was built in such a sacred place helps you feel connected to the tragic events of September 11th. They actually opened their doors a little before 9 am. Once you go inside you have to go through airport-style security. You are allowed to bring food into the museum, you just can’t eat it while you are there. You are also allowed to take photographs in some parts of the museum, but you are not allowed to use a flash. In this room, you can see the Last Column and the reinforced concrete walls from the Twin Towers. We decided to just explore the museum on our own, but they do have guided tours, which last an hour. If you like you can also download their app which includes audio tours. However you choose to experience the museum, I can guarantee it will be a moving experience. The exhibits start downstairs with a display that gives an overview of what happened on September 11th. Then you hear audio that takes you back to that day that changed everything. It sets the tone for the rest of the museum. As you go further into the museum, you will see some of the larger artifacts and photographs. There is one photograph before the attack where the twin towers just look stunning, then right around the corner, you see them burning. It is pretty powerful! Seeing these photographs side by side you can see the devastation was pretty dramatic. Speaking of impactful, it is hard to comprehend the amount of damage the buildings sustained when they were hit. Seeing the steel from the building that was mangled helps put it in perspective. Seeing how badly a fire truck from the scene was damaged shows how intense the conditions got. And on the other end of the spectrum, you will see what is called the survivor stairs, still mostly intact. These stairs were the pathway to safety for many survivors. Fire Truck that was destroyed on 9/11. You also get a chance to write a message on a map displayed on one of the walls. Even at this point, it was hard for me to find the right words. All I could say was “never forget.” To me, it is very important that we honor those that lost their lives and try to learn from the lessons of that day. On another wall, you will see one quote that has stuck with me. 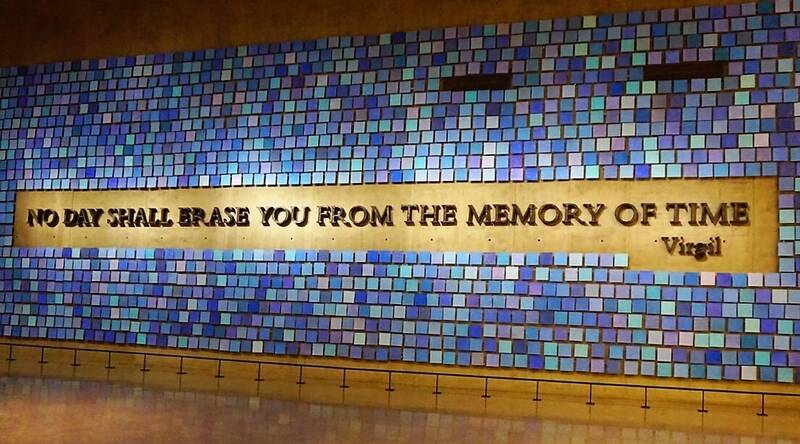 It is written in large letters between a sea of blue tiles – [clickToTweet tweet=”“No day shall erase you from the memory of time.” – Virgil” quote=”“No day shall erase you from the memory of time.””] The quote comes from Virgil, but it is fitting for the museum. In the center of the large space, you can’t miss the Last Column. 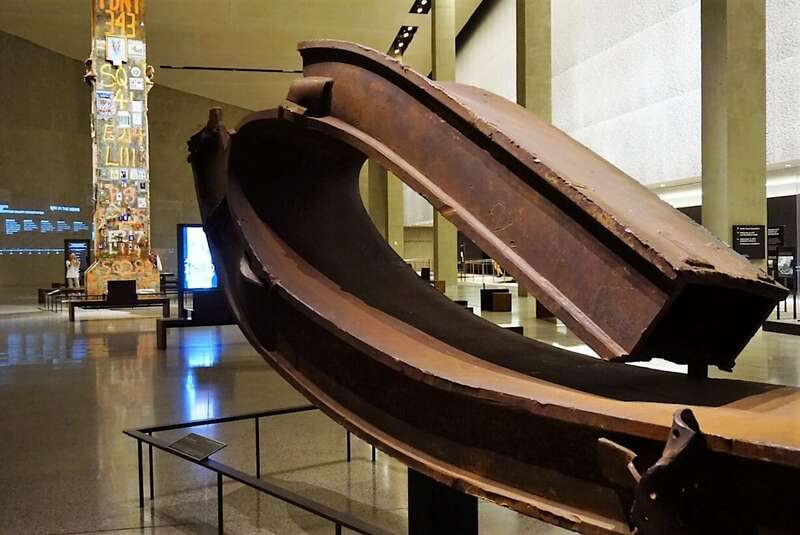 This was one of the steel girders that held up the South Tower. Many first responders were believed to be buried nearby and the column became an unofficial memorial as people wrote messages to their loved ones, friends, and colleagues on the steel. 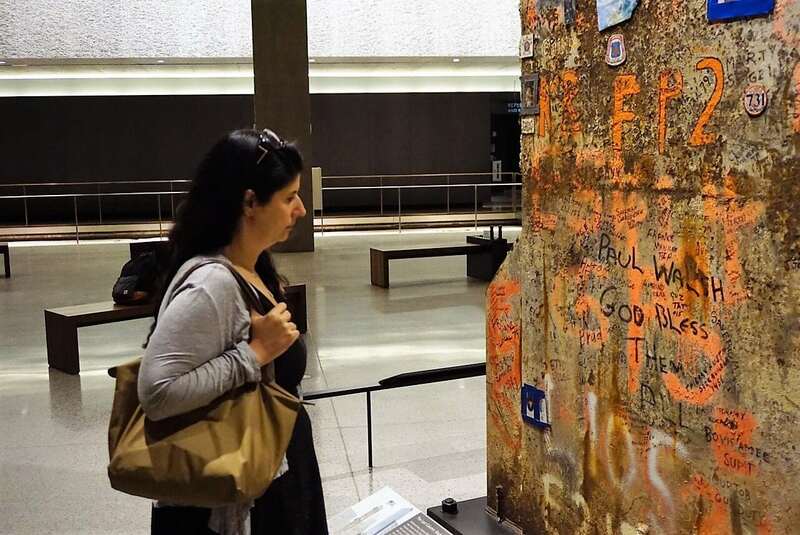 As the number of personal messages increased, the decision was taken to make this the last piece removed from Ground Zero. I would encourage you to take your time and have a closer look at it. The writing on the column is very moving and gives you a sense of the emotions of those that were doing the cleanup. Anisa reading the message on the Last Column. You will want to spend the bulk of your time inside this exhibit because there is so much to see, read, and listen to. The permanent collection has more than 11,000 artifacts, over 300 moving images, and more than 40,000 photographs. The task facing the museum is a difficult one – to display these items and present the story of the day in a way that is respectful, moving, understandable, and not leave people emotionally overwhelmed – and they handle it well. This is an exhibition that tugs at your heart. Understandably, photography is not permitted in this part of the museum. Some sections that may be particularly difficult to see are set back in alcoves with notices that the contents of that area may be particularly emotional. There are boxes of tissues mounted on the wall in these areas. You can enter the alcove and view its contents, or walk past. Whether you choose to see these areas or not, it is an emotional and powerful experience. The exhibit is arranged in chronological order with a timeline on the wall that you follow to learn the details of what happened that fateful day. The timeline starts at 5:45 am. You see photographs of hijackers Mohamed Atta and Abdulaziz al-Omari going through airport security in Maine for their flight to Boston, where they would board Flight 11. They also have a clip from The Today Show on NBC when the news was first breaking, which I remember watching when it was happening. Don’t just follow the timeline though, there is information on both walls and in the middle of the room, as well as the alcoves mentioned earlier. I thought it was fascinating to see some of the artifacts they collected next to pictures of the item from that day. They had shoes, backpacks, papers, and more. There are so many heart-wrenching stories. The thing that got to me the most was the voicemail recordings. Especially the one that flight attendant CeeCee Lyles from Flight 93, that crashed in Pennsylvania, left for her husband after the plane had been hijacked. She asked him to tell her kids that she loved them and said that she hoped to see his face again. Hearing her speak those words, made me want to hold on to Russell even tighter. The exhibits in the alcoves are challenging. 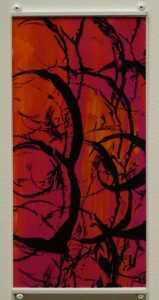 It is an intensely personal choice, but I would encourage you to view them if you can. One that is especially difficult to see is the exhibit about those that chose to end their lives by jumping. I just cannot imagine having to make the choice between burning to death and falling. Once you finish the timeline exhibit, you get to a section that talks about some of the events that led up to 9/11. You learn more about Osama Bin Laden, who was the leader of Al Qaeda, and attacks that happened before 9/11. Many people may not know that the Twin Towers were also bombed back in 1993. You also learn more about what happened after 9/11 including more about the recovery efforts. You will see the cross found at Ground Zero. It’s actually a piece of steel from one of the towers that is in the shape of a cross. They also talked about how difficult the recovery has been. There are still over 1,000 victims that have never been found or identified. One reason is the sheer force of the impact and the collapse of the towers. You will see a large rock which is actually several floors of one of the towers compressed together. The impact was so intense that it bent this steel beam. There is also a short film about the revitalization of the area, but there was a pretty long line by the time we got to it so we did not have time to see it. One of the things that helps to bring the events of that day to life is hearing the voices of the people involved. At the museum, they have a recording studio where you can record your experience that day or answer some of the discussion questions. You can also watch the videos that other visitors have recorded. You enter one of the private recording studio rooms and you will watch the video instructions. Then, you can choose your topic or question like “How has New York changed since September 11th?” They allow you to re-record your video as many times as you need to until you are happy with it. Then you can agree to allow the footage to be included in the museum’s archives. 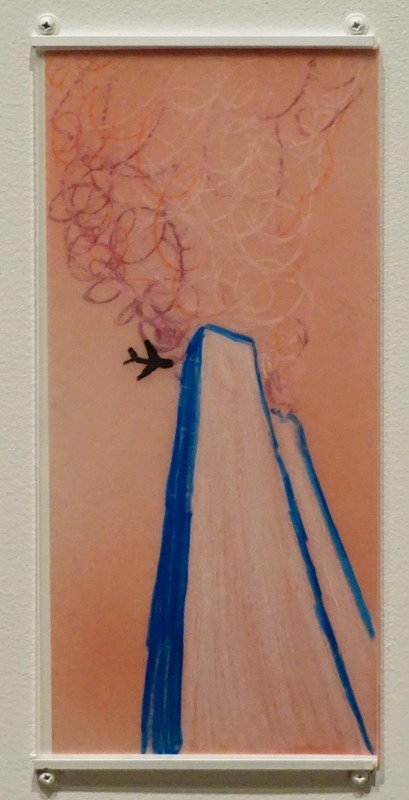 The museum has a small collection of art that was made in response to the terrorist attacks which I also found very moving. 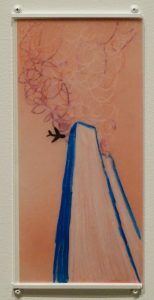 It was interesting to see how artists used their experiences of 9/11 and channeled them into their art as a means of expressing their emotions. Please take time to read the story behind each piece of art when you visit the museum. I wanted to highlight two of the pieces here. 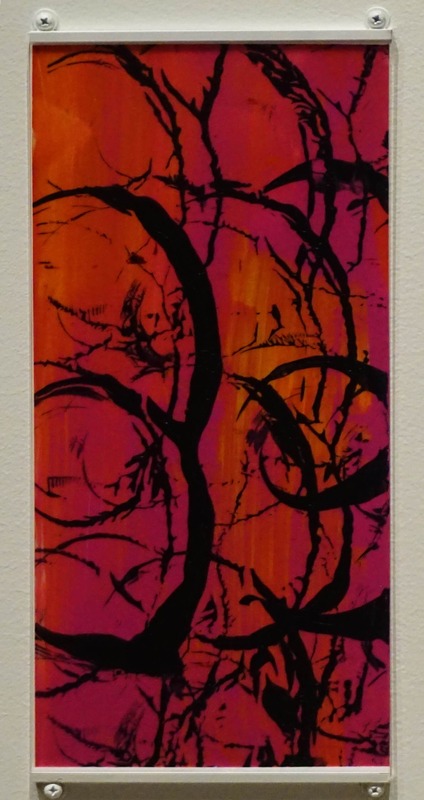 One artist, Manju Shandler, created a small painting for each victim as a tribute. 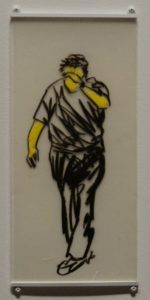 Yes, that is 3,000 individual paintings (you can see some examples below). The museum has 850 of these paintings on display. 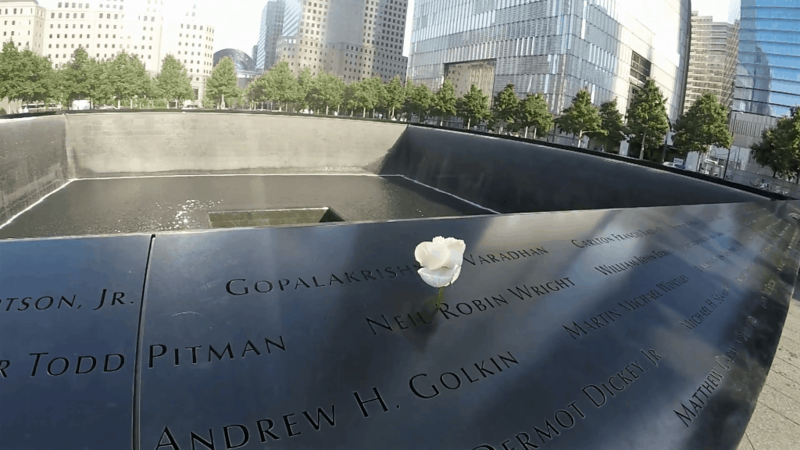 The founders of the Blue Man Group put together a short film called Exhibit 13 that uses papers that they found in Brooklyn that came from the World Trade Center. The music they composed to go with it just gave me chills. I would have liked to have had more time to spend in this section. Around the outside walls, there are photos of the victims. Then you step inside a dark room, where the names are read. At first, it reminded me of the reading of the names that they do each anniversary, but it’s more than that. They tell you a little about each person and you also get to hear their friends and family talk about them. It got me emotional – not for the first time that day! The 911 Museum is the most moving museum I have ever visited. We spent a little over 5 hours at the museum and we probably could have used another hour or two! They did an amazing job telling the story of that day. I encourage everyone to visit. Be sure to check out our video for more insight. There were definitely parts that made me feel sad, especially the voicemails. I kept thinking of how I would feel getting a voicemail like that and how heartbreaking it must have been. I also thought about the times I didn’t pick up the phone because I was out with a friend or out running errands or at work. From now on, I want to be better at that. If I have the chance to talk to a loved one just once more I don’t want to miss it. It’s also a good reminder to make sure your loved ones know how you feel about them! I thought this quote was perfect for the museum. Then, I thought about how I would have reacted if I had been in New York on September 11th. I was so impressed by how calm so many of the victims were. Would I have been able to keep my composure? I also just couldn’t imagine the waiting and not knowing if someone I knew was missing. My heart breaks for those that lost their loved ones. I also thought about all the first responders and how brave they are. They risk their lives every day for strangers. I don’t want to think about how many more people would have perished if it wasn’t for those brave men and women. I am so thankful for them! Finally, I thought about the hatred in the world. It is hard for me to understand how there is so much anger, bitterness, and hate that would lead someone to commit a terrorist act and kill so many innocent people. It is remarkable how New York City made it through the attacks. I believe NYC came out an even stronger city. I felt determined to make sure that we don’t let terror win. Love will conquer all. 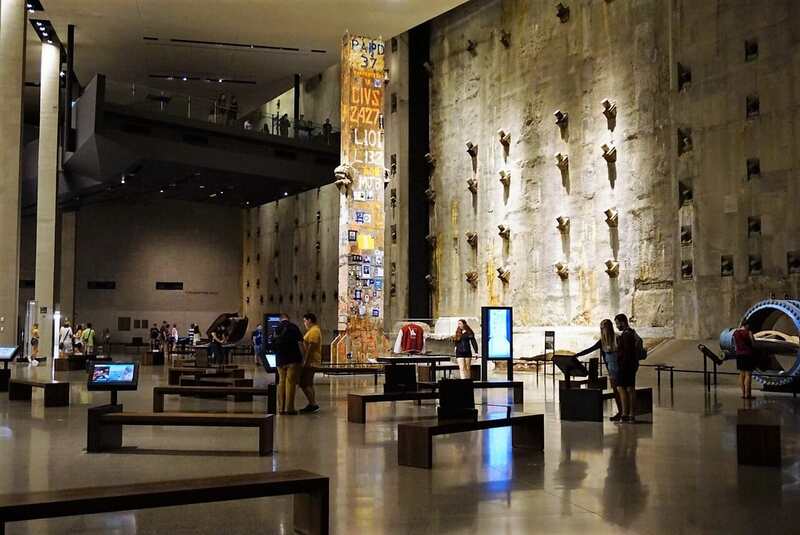 Have you visited the National 911 Memorial or Museum? If you are comfortable, I would love to hear your story about September 11th, the Memorial or Museum, or how the events have impacted you. Walk around the Memorial and read the names. Timed entry tickets to the Museum should be purchased online in advance of your visit. If you want to save money sightseeing in NYC, the 911 Museum is also part of most NYC tourist passes. Go to the Museum as early as you can as it will get crowded. I would recommend allowing around 5 hours for your visit if you want to see everything. Photography is allowed in certain areas of the museum, but you are not allowed to use any flash. Disclosure: No financial compensation was received. We were given complimentary tickets to the National September 11 Museum so that we could share our experience with our readers. As always, opinions expressed here are my own. PreviousPhiladelphia Mural Tour: Street Art That Changes Lives! We live in NYC and have people that we have lost in 911 so this really hits home for us.We actually did not know about the listing of the pregnant woman either. We HATE when we see tourists taking selfies smiling and laughing at the memorial, it is so disrespectful. As well as when people drag their purses over the fallen victim’s names… man that really boils our blood. But thank you for going into such great detail. This really helps people to feel what the memorial is all about. Thank you, I really appreciate that. I know it is a really touchy topic but its important and I want people to know more about it. The museum really is so moving and just has so much to see, I could have written a short book! Tomas – Thanks so much, glad you enjoyed the post. I hope you get to visit on your next trip. Upeksha – Thank you! You know I had seen the flowers before but just saw the sign explaining them this time. Excellent post. You did an amazing job sharing the importance and beauty of this place. I never knew the purpose of the roses before and believe that is such a wonderful touch. Thanks for sharing on #TheWeeklyPostcard. Sarah – Thank you. It’s not easy to write about a sensitive subject but I felt it is important that people know more about the memorial and museum. Nancy – You won’t regret it. So glad to hear my post was helpful. Although I was young I did live in NY at the time and I would say it was pretty traumatic even though I was only in the 5th grade. I recently got to see the memorials at night and I too noticed the birthday flower. I thought that was so sweet that they would even do that. I wonder is that something they plan to continue forever or will they eventually stop doing it. I didn’t know about the pregnant mothers. I was unable to see the muse because it was so late but I would really like to go back. Thanks for checking it out. Victoria – Wow, I can’t imagine what it was like as a kid in NYC at that time. I hope that they always keep doing the birthday flowers and I hope you get a chance to visit the museum. Wow what a moving experience! I visited Ground Zero in 2005 and it was still under construction! Even then I cried as I read the stories and looked around at other people. It’s hard not to get emotional there. It must have been gut wrenching to visit the museum and read the names of even unborn children! #TheWeeklyPostcard! Lolo – Yes it is a really emotional place. There are just so many heartbreaking stories. I went to the memorial a few years ago before moving to London, but couldn’t get myself together enough to go into the museum, so your post was really helpful showing me what I missed. 9/11 happened a few days after I moved to lower Manhattan–I will always carry the memories of the horror, chaos and unity. Wow Shalon, I can’t imagine! I couldn’t include everything at the museum because there just is so much, but glad you found the post helpful. I recently went to the memorial and it is a beautiful sight. It is so moving. It is so important to remember what happened and your post really highlights that. Yes, Ashlee. They really did an amazing job with the memorial. This post made me a little emotional. I’m from NYC and will always remember 09/11. The memorial was created when I moved out of the city, but I definitely need to visit when I go home. This was such a great recap of your experience. Thanks for sharing! Jewels – I think it’s hard not to get emotional when you think about that day. I hope you get the chance to visit. Thanks so much Sarah. Yes, it wasn’t easy and I did try to be very sensitive. I hope you get to visit one day. This is really well done, and very respectful. It is so difficult to write about places like this memorial, and you handled it admirably. Theresa – Thank you! Yes it wasn’t easy. I wanted to try to be sensitive to everyone’s feelings and it’s such a touchy subject. 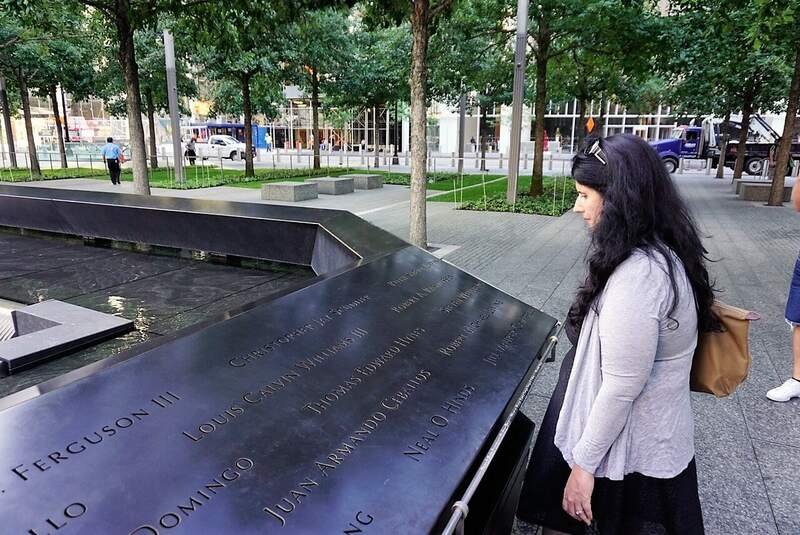 Visiting the September 11 Memorial & Museum must have been an incredibly moving experience 🙁 My husband was visiting NY City at the time when the towers came down … he was just a few blocks away … very traumatic for him! I have never been to NY but would like to visit this museum with him one day. I shared your post with him today … Thanks for such a well-written piece. Thank you! Wow, I can’t imagine being a visitor and being so close! I hope you do make it to New York. I think you would really appreciate the museum. I’ll go to the Memorial someday, I hope! Leigh – I know several people with the same situation. Backcountry trips sound like a great solution. I hope you make it to the Memorial someday. It’s a powerful and beautiful tribute to the victims of 911. I can imagine the feeling of visiting the site. Great post! Thanks Tamar. I hope you get the chance to visit. Kat – Well said. I hope you get a chance to visit the memorial and museum. Michelle – It was really hard to write about this. And yes, it is very tastefully done. I know it’s difficult but if you get the chance, you should try to go to the memorial and museum. Thank you for posting this. My husband, daughter and I had the opportunity to visit the memorial several years ago. It brought us all to tears as we remembered those who have fallen. My husband is a police officer, therefore it was especially moving to him. They did a wonderful job honoring the people involved in this terrible event. Michelle – You are welcome. I think they did a great job too. Thank your husband for his service for me. This is so beautifully written and captured on your video. I visited the Memorial shortly after it opened, but the Museum wasn’t opened yet. It’s definitely time for me to go back. Just reading this and seeing the pictures, seeing the last standing column, brought up so much emotion. This is a day the entire world changed. Thank you for sharing this post. Cynthia – Thanks so much. It really is an emotional experience, I hope you get the chance to visit the museum. Anda – I think you would be impressed with how the area has developed now. I hope you get a chance to visit on your next trip. Laura – You are not the only one, but yes I do think it is really important to remember. Thank you so much for sharing your visit to this moving place. I remember turning on the TV that morning of 9/11, briefly watching a report that a small plane, maybe a helicopter, had crashed into one of the towers. Not thinking much of it, I switched to a kiddie show for my then toddler. Even though I had no connection to anyone involved, I mourned along with the rest of the country. I may be headed to NYC next summer with my Girl Scout troop, and this memorial is one of the places the tour takes us to. I am already wondering how to frame this experience for a bunch of middle schoolers. Michele – Glad you appreciated the post. There were plenty of kids at the museum. I really wonder how it affected them. I think it would be such a moving experience to visit Ground Zero. It is a day that is still etched in my memory, even though I was half a world away. I was getting on a plane (for work) first thing that morning. The pilots and us crew were sombre and nervous, as were the passengers. I was pleased to see that the city made the memorial and just didn’t think of that land is too valuable and erect another building. It is so important we remember what has happened to ensure we stay vigilant in trying to prevent such things happening again. Sally – Wow, I can’t imagine traveling right after that, but I know when it’s work you have to. I hope you get the chance to visit the memorial and museum some day. What a great post, Anisa. Believe it or not, we have not gotten to New York for a proper visit! (We can’t believe that ourselves.) So, not only had we not seen the Towers up close, we haven’t seen the Memorial, either. To be honest, that’s partly intentional. Neither one of us can pass that date without being very emotional. Not sure how we’d handle the Memorial. We do appreciate seeing it through your eyes, though. Thank you for sharing. You guys definitely need to go to New York for a proper visit. I know it’s hard but I think it would be good for you guys to visit the memorial.